All new, inside and out! Maximum occupancy is 6 with no more than 4 adults. Please review the policies that are sent by me when you make an inquiry. 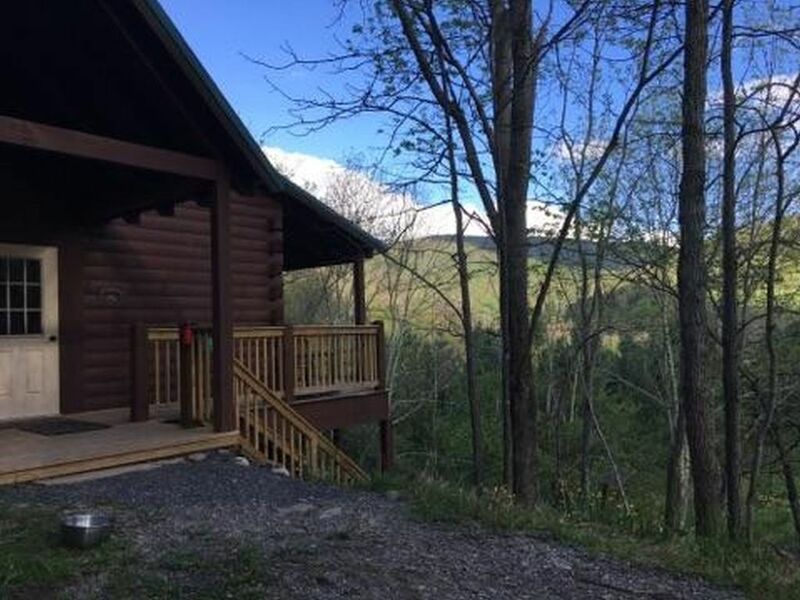 Enjoy our log cabin with views of the West Virginia mountains. If you want to stay in a quiet place away from the hustle and bustle, but also want easy access to a number of activities, this is the place to stay. The cabin is located in Slatyfork, two miles from the four season resort of Snowshoe Mountain. The cabin sleeps six in three queen size beds with one bedroom and a loft. Bring only clothes/toiletries and food! This cabin has everything you need: full kitchen, sheets, towels, paper and cleaning products(not personal toiletries), and a porch with mountain views. Play golf at the Gary Player designed Raven Golf Course, voted #1 Public Access Golf Course in West Virginia for the fourth year in a row. Enjoy a walk through Slatyfork Farm development adjoining our property. We love our pets and understand you may want to bring your pet on your vacation. We are pet-friendly; just tell us type and number of pets you are bringing. Linens and cleaning upon departure are included in our rates. There is a small grocery store, gas and unique shopping one mile from the cabin. Four wheel drive recommended in the winter, but we are right off well-maintained Highway 219 leading to Snowshoe. Seasonal Activities nearby(please check with vendors schedules before your visit to ensure availability): Skiing, Snowboarding, Snowmobiling, Snowshoeing, Cross Country Skiing, Hiking, Rock Climbing, Biking, Golf at Raven Golf Course, Snowshoe’s Outpost Adventure with BMX Track, Sporting Clays and Climbing Wall. One of the most popular recreational activities in Pocahontas County is fishing. Eight Rivers (Cheat, Cherry, Cranberry, Elk, Gauley, Greenbrier, Tygart Valley, Williams) and countless streams originate in the area. Take a scenic ride on the Cass railroad(check seasonal schedule and buy tickets ahead because they book up quickly), mountain bike, hike, fish, bike the Greenbrier River Trail or float the Greenbrier River. Visit the National Radio Astronomy Observatory, Lost World Caverns, Falls of Hill Creek, Droop Mountain State Park, Beartown State Park, Watoga State Park and Seneca State Forest. Nationally recognized, the Highland Scenic Highway, is a must see. Cutting across Monongahela National Forest, this 43-mile route, much of which follows Rte. 150, the highest major road in the state- provides dramatic views of the Allegheny Highlands. This scenic byway, accessible from April through November (weather permitting) begins just south of Slatyfork and travels through hardwood forests to Richwood. Along the way, you’ll find wildlife, waterfalls, 150 miles of hiking trails, and the 36,000 acre Cranberry Bogs Wilderness Area and Visitors Center. The county is home to two other nationally recognized scenic byways as well that are accessible year-round. Our family, including our daughter, son and daughter-in-law, loves to ski. We also love coastal living in our home of Savannah,GA. Since we rarely get snow, we started visiting West Virginia to enjoy snow and skiing. After visiting the area during other seasons, we realized that we loved West Virginia year-round. We bought our home with plans of renting it out to visitors. We feel very fortunate to have the opportunity to enjoy the cabin and share it with others. Visit soon in any season and enjoy all West Virginia has to offer from the comfort of our cabin! Our cabin is conveniently located to enjoy all activities in the area. We enjoy our location in the mountains since we are from a coastal region. Local and U.S. long distance. Cell phones don't work in area because of National Radio Astronomy Observatory. ATT/Singular calls may work in one spot on top of Snowshoe Mtn. diagonally across from 4848' Gift Shop. The dining area is part of the living and kitchen area that is 15 x 19ft. There are 4 chairs & 2 stools. The dining table has to be pulled out of corner to seat 6. Max occupancy - 6 with no more than 4 adults. The cabin was beautiful, the location was great, and the owners were very responsive and helpful. Thanks for visiting! Hope you come back to the area soon! Mountain Mama's was perfect. It is located just at the base of the mountain, right before the red barn ski rental. It was close enough that we could go back to the cabin for lunch or in between going from the Village to Silver Creek. The inside was very cozy and clean. Nice place all around. We are glad you chose Snowshoe and Mountain Mama's! All I can say is we did not want to leave! The cabin was spotless and had everything as advertised. It was private and quiet but very close to the Snowshoe entrance. We skied three days, but came back early enough to walk our dog (great gravel walking area, or if you let yours run free, fields too). We cooked bfast and dinner each night and enjoyed the living room fireplace and tv. The cabin is cozy and it was all we needed for the 3 of us (and dog!). Very convenient and quiet! Chrissie was great to work with! We are glad you enjoyed the cabin and Snowshoe! Come again and relax in any season! Cozy and spotless, as always. Wish we could have stayed a few more days, but the family got 2 good days of skiing in. See you next season! We are always grateful for your family's return visits! We recently stayed at mountain mamas, cabin was just as described and our family had a wonderful stay. Close enough to snowshoe to ski in the morning and come home for lunch then head back to the slopes. Cozy and CLEAN we would definitely recommend this place to friends and family! The driveway was a bit steep so I would definitely recommend all wheel drive or 4 wheel drive in the winter months. We had no problem at all in our all wheel drive Toyota Highlander. As a side note, we would not recommend eating at Route 66 which is at the bottom of snowshoe, horrible food and service! Just an FYI. Our bad expierecne at Route 66 was the ONLY negative thing about our trip. Mountian mamas was wonderful and we would love to stay again. Also Chrissie was very easy to work with and always promptly returned emails and phone calls. We are so glad you enjoyed your stay! Thank you for your kind words. Sorry about restaurant experience. Come again when you can! We absolutely loved our stay at Mountain Mama's! It was perfect for four adults and 2 kids. The cabin was so clean, with perfectly selected decor, and modern fixtures. The owner's were easily accessible, in case there were issues. This place is half the price of snowshoe lodging for a much more comfortable and personal place to stay, only a short drive to the Snowshoe entrance (as described). The owner's were so wonderful and allowed us earlier check-in. They even offered to ship an item to us that we had left in the cabin on our departure!! We will 100% be returning to this lovely spot on future trips. I can't possibly give a more glowing review. So glad you enjoyed your visit! Thank you for your kind comments and come back soon! It is great at all times of year. Fly fishing, Rafting(1-3hrs away), Go Fly fishing on Cheat Cherry Cranberry Elk Gauley Greenbrier Tygart Rivers! Kids of all ages will enjoy the new indoor rec center which also doubles as a special event room. Basketball goals, pool and hockey tables and video arcade along with night time family entertainment. (Call Snowshoe to ensure that building is not in use for a special event rather than for kids' activities)! A credit card number is required in lieu of a security deposit. Holiday rates $250 per night 12/18/17-1/7/18, 1/12-14/18 & 2/16-18/18. All rates are plus 12% lodging tax. Rates are subject to change until reservation is confirmed.